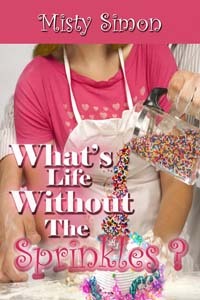 Cake maker and single mom Claudia Bradley thinks she has life all figured out — until her best friend Nate starts looking like a mouth-watering dessert and her son’s father comes strolling back into the picture as if he’d never left ten years ago. Throw in a case of preteen angst and a family with lots of well-meant advice, and, well, she’s whipping up a recipe for chaos! Nate West has always been there for Claudia, a basic ingredient in her life, but suddenly she is flirting outrageously with him when she’s never looked that way at him before — despite his dreams. With her ex-lover back in town, Nate isn’t about to renege on his years-old promise to always be the friend Claudia needs, but does she want more?